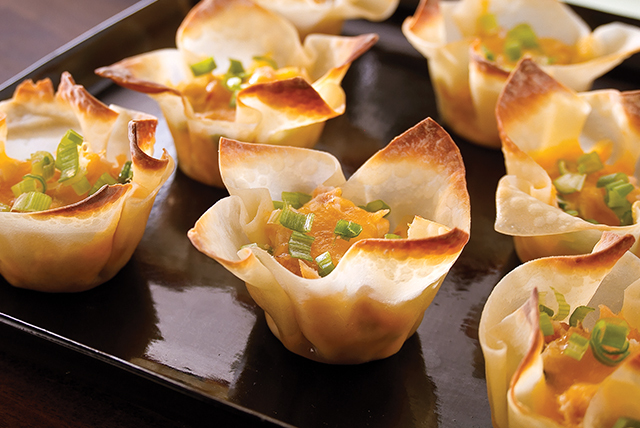 They look like they were prepared by a star pastry chef, but won ton wrappers make these delicious smoked salmon cups a snap to put together. Mix cream cheese and 1 cup shredded cheese in medium bowl until blended. Stir in salmon and onions. Spray 24 mini muffin cups with cooking spray. Line each cup with 1 won ton wrapper. Fill with salmon mixture; sprinkle with remaining shredded cheese. Bake 10 min. or until won tons are browned. Substitute 1/2 cup finely chopped green peppers for the onions.